The only thing this film made me feel was aggression. Two stars for the two leads. A father is accused of a crime he has no memory of committing. Cue a dull by the numbers mind-number of a thriller. 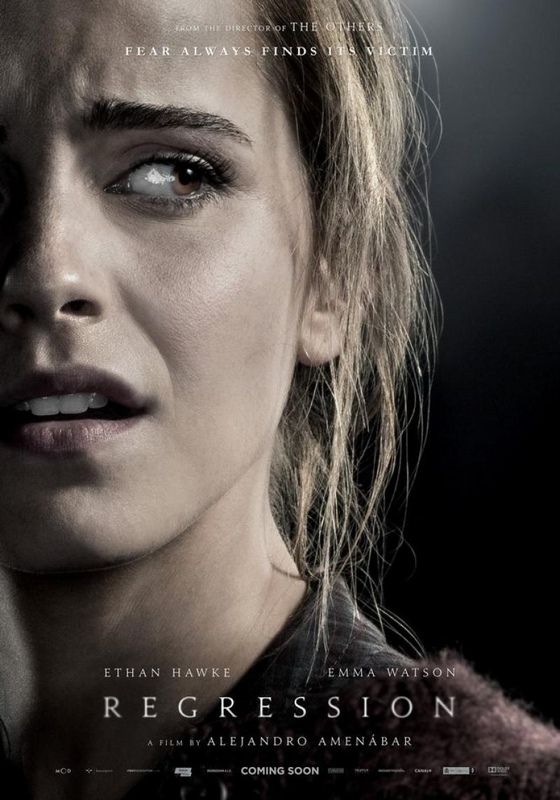 The trailers didn’t give much away BUT as soon as I saw that it was penned by Alejandro Amenabar and starring Hermione from Harry Potter, I thought why not? What a mistake. I expected Regression to be in a similar vein to The Others. Slow burning with a tense but thrilling finale. Tragically, this was just slow. Hawke’s detective desperately kept things watchable. Only because his character was so laughable. His volatile mood swings made for unintentionally comical viewing. The premise behind the regressive hypnotherapy had potential but it never really got going. David Thewlis did his best to make the psycho babble engaging BUT all it did was reduce me into a hypnotic state. It took a good 30 minutes before anything of real merit grabbed my attention. I couldn’t care for the crime aspect of the story. Mainly because it was so generic and formulaic. Hawke certainly did his best but the red herrings were so lazy that I was a little insulted. And poor Emma Watson. A talented actress. Reduced to a nothingy role that anybody could have played. The only thing I could applaud was her impeccable accent. She was either crying or spewing uninteresting bile and repeating the same old story that wasn’t that engaging the first time. A waste. Thankfully the middle act offered some redemption for this shambolic dud. The supernatural element behind a suspect cult was the much needed catalyst. Something that Amenabar has always excelled at. So why didn’t he put in more of it? 45 minutes in. I was finally intrigued. Hawke’s headphone sesh around a dilapidated warehouse was tense and unsettling. A brilliant scene as Watson’s commentary juxtaposed with some creepy images really put the heebie jeebies into the demented rituals that were supposedly re-enacted in this messed up crime scene. Amenabar delicately teased the darker intent of this mysterious cult. Torture, sexual abuse and horrific sacrifices. That and Hawke’s paranoia and obsession did just enough to keep me from walking. At first I thought Daniel Aranyo’s cinematography was a little too dull and murky for this lifeless flick. BUT he was finally able to get a little more creative. Hawke’s dream sequences were slightly Kubrickian in their execution. Especially when he wakes up to the hooded white faced Dementors surrounding his bed. There was also another scene that was a perfect homage to Rosemary’s Baby. Dale Dickey (Winter’s Bone) was probably the only other character that made a memorable impression. She played the grisly grandmother with aplomb. If anything there wasn’t enough of her. She really stole every scene she was in. And for all the mystery, I expected more to be made of her character. And that was the problem. The real horror after a promising second act was that it was all for nothing. The finale was terrible. The revelations were tragically predictable. It took a direction I really hoped it wouldn’t and with a twist you could see a mile away. I can see what Amenabar was trying to do BUT it ruined the film. And the ‘Based on a True Story’ end credits undermined the whole piece for me. If not for Hawke and Watson’s involvement, I honestly don’t think this would have graced the silver screen. If anything, this is the sort of paranormal cold case story I see constantly featuring on the numerous channels of my Sky box.